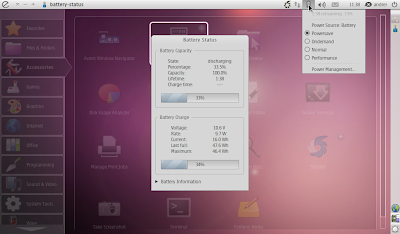 Battery Status is a GNOME panel applet that shows information about laptop battery state - but has a lot of extra features compared to GNOME's Power Manager icon. Battery Status applet features a battery status dialog, power statistics, CPU frequency scaling and power management preferences. Good news for Ubuntu 10.10 Maverick Meerkat users: with a bit of a delay - but it's better late then never -, the Battery Status PPA has been updated with Ubuntu 10.10 packages. To make Battery Status indicator run each time you log in, go to System > Preferences > Startup applications and add the above command in a new entry. If you don't want to run Battery Status with an appindicator, simply right click the Gnome Panel (this will only work if you don't run Unity for Ubuntu 10.10 or if you run Ubuntu Netbook Edition 10.04 - you have to unlock the panel first), select "Add to panel" and then add Battery Status as a regular Gnome Panel applet. If you're not using Ubuntu, you can download Battery Status @ Github. Note: I've only tested Battery Status in Ubuntu Netbook Edition 10.04 because I didn't upgrade to 10.10 on my netbook. For a similar tool, see Jupiter.